ImTOO MP4 Converter for Mac can convert almost all video formats to Mac. ImTOO MP4 Converter for Mac is a unique Mac MP4 converter to get MP4 video by converting video files including AVI, MPEG, DivX, MOV, M4V, 3GP. It can also convert audios like MP3, WMA, WAV, M4A, AAC, MP2, AC3 on Mac OS X. The output MP4 files are playable on iPod, iPhone, PSP, Apple TV, Archos, iRiver, Creative Zen, PS3 and other portable MP4 players. 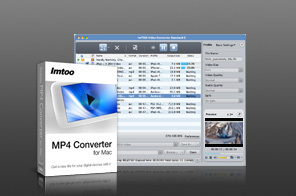 ImTOO MP4 Converter for Mac is especially designed for Mac users. This Mac MP4 converter can convert videos like MPEG, MOV, 3GP, M4V, VOB, AVI to MP4 movies, and convert audios like WMA, WAV, M4A, AAC, MP2 and AC3 to music MP3, M4A and AAC. ImTOO MP4 Converter for Mac is developed specifically for any portable MP4 players like iPod, iPod touch, iPhone, PSP, PS3, Apple TV, Archos, iRiver, Creative Zen. You can take a snapshot, trim video and audio, and adjust the output settings, rename output file with ImTOO MP4 Converter for Mac. Convert videos like AVI, MPEG, MOV, M4V to H.264, H.265/HEVC, MPEG-4, DivX, XviD videos. Convert various audios like WMA, WAV, M4A, MP2, AAC and AC3 to MP3, AAC and M4A audios. Extract audios from AVI, MPEG, MP4, MOV, M4V, 3GP, ASF videos to MP3, AAC and M4A audios. Support various MP4 players: iPod, iPod touch, iPhone, PSP, PS3, Apple TV, Archos, iRiver, Creative Zen. Trimming function lets you trim video or audio file and enjoy favorite clip on your MP4 player. Provide you rich output settings: bit rate, frame rate, sample rate, codec, channel and zoom. Allow you to directly convert video or audio segment by setting the start time and duration. Customize profile list and choose common-use formats to display in the profile list for quick access. Output converted files to devices like iPhone 4 and etc directly after conversion. Capture movie images you like when previewing movie/ video and save them as BMP files. Convert video files to iPhone MP4 video and audio files on Mac OS.